Stuart McInally is a young back-row player who can operate at No.8 or flanker and looks set for a long international career for Scotland. 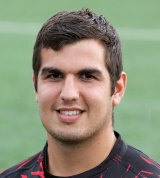 The Edinburgh player, who has appeared at all age-group levels for Scotland along with the Sevens side, received his first senior international call up for Scotland in October 2012 ahead of the autumn internationals. He captained Scotland's under-20 side for the 2010 Six Nations and was part to the 2009 World Championships side.